Note: New York-bred won two restricted stakes at Belmont last year and made his 2006 debut a winning one in the Swale Stakes at Gulfstream Park against open company. 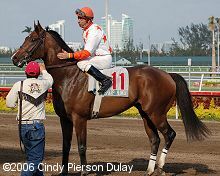 Proved he could stretch out to a distance with a strong second in the Florida Derby only a half length behind Barbaro. Didn't run a lick in the Derby and finished 19th.